After Bela Lugosi’s triumphant, heartfelt turn as Ygor in Universal’s Son of Frankenstein (1939), it seemed that his fortunes, like those of the horror industry, were on the upswing again after the mid-to-late 30s doldrums. He was suddenly hot again, seemingly in demand at a wide spread of studios: for Fox in The Gorilla, Metro (as Commissioner Razinin in Garbo’s Ninotchka) and producer John Argyle wanted him again over in England. There was talk of priming him for lead roles in 1939’s The Hunchback of Notre Dame (taken superbly by Charles Laughton) as well as The Invisible Man Returns. When the initial rising tide of activity went out though, the rumours and hearsay had dissolved into a shoreline of dregs left behind for him to comb through. Lugosi began his steady decline with no choice but to accept contracts with the lowest rung studios of Poverty Row. 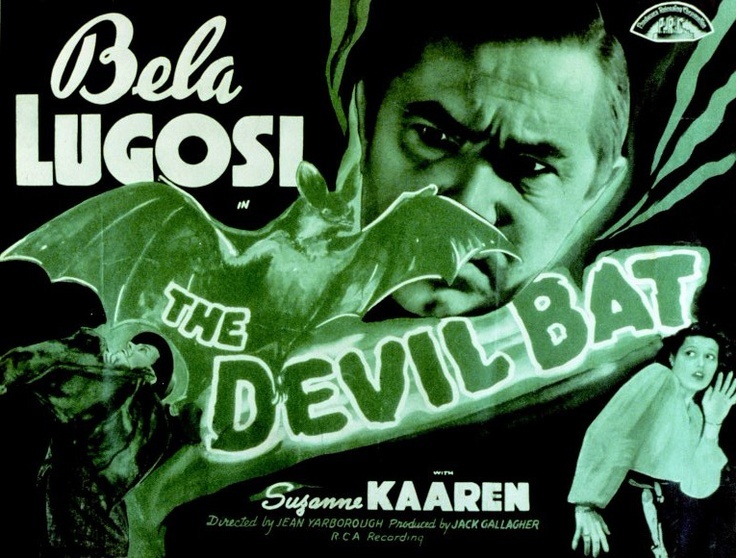 Before his infamous ‘Monogram Nine’, he took the lead in 1940’s The Devil Bat. Directed by genre stalwart Jean Yarborough and scripted by John Thomas Neville, this was filmed by Producers Releasing Corporation (PRC) who were so tacky that even Monogram and Republic looked down on them during their productive cycle between 1939-1947. 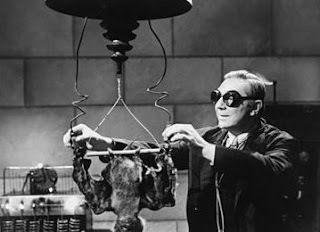 Unlike the other two, in PRC’s defence they aimed to at least satisfy a public demand for more lurid horror, making the most of using Lugosi then another not-too-proud horror star George Zucco in The Mad Monster (1942), Dead Men Walk (1943) and Fog Island (1945). Bela Lugosi may have only worked once for PRC, yet The Devil Bat lingers in the memory like a dead rodent in the bread-bin. He plays Heathville’s kindly village doctor Dr Paul Carruthers, which for once either disproves what I’d said in my review of The Man with Nine Lives about M.Ds never being given Wasp-ish names – or the part had been intended for a more white-bread, still inexpensive, actor. Behind his warm public persona, Carruthers is secretly conducting ‘certain private experiments – weird terrifying experiments’. We know this because the unsubtle prologue rams this home on screen to save us any deliberation. We are then introduced to Carruthers in his secret laboratory where he has strung a stuffed bat upside down and wired it to instrumentation. “Our theory of glandular stimulation through electrical impulses was correct”, he drools. His leather-winged silent partner says nothing, mainly because its cute little close-ups are inserted shots of stock footage. After some repetitive shots of his begoggled visage blasting the innocent bat with electricity, Carruthers accepts its tentatively opening wings as proof that now he has a lethal weapon fit for purpose. “You will strike…to KILL!” he urges. The Devil Bat is not simply the tale of a mad scientist killing without purpose. Oh no, this is a searing revenge story of a man who murders over something of enormous significance. The besmirched reputation of a monomaniac? No. The cuckoldry of a jealous or grieving husband? Wrong again. This is vengeance over that classic horror movie plot device: greaseless cold cream for the ladies. The doctor is an employee of Martin Heath (Edmund Mortimer), a cosmetics empire baron who gypped him into taking ten grand for his make-up marvel instead of shares in the resulting fortune coined in by Heath and Henry Morton (King of the Zombies’ Guy Usher – see review 5/12/2016). The set-up sabotages Lugosi from the start since it is hard for such a passionate performer to wax his bravura operatic arias inspired by moisturiser. The Hungarian horror maestro at times appears understandably listless at the waste, mildly pained with indigestion rather than animated zeal. Carruthers’ simmering ire at one point tries to seep out in a seething inner monologue - “They are rich and happy and what have you got, Doctor?” – the effect of which would be powerful if it didn’t sound as though he was running lines through a toilet door off-set. He uses the ultimate passive-aggressive solution of murdering Heath’s offspring one by one beginning with Roy (John Ellis) through a cunning after-shave concoction which attracts the bat to fatally attack whomever wears it. Lugosi’s usual artful spin on a line of loaded menace eludes him here when he throws away the double-meaning of “I don’t think you’ll use anything else” when next-victim-in-line sibling Tommy dabs himself with the liquid. One brief spark of engagement is his contemptuous reaction to a mammal expert on the radio: “Imbecile! Bombastic ignoramus”. 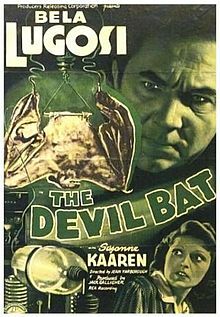 While the Max Factor is in full effect, the dreary daftness is injected with some energy care of smooth-talking reporter Johnny Layton (a pleasingly-relaxed Dave O’Brien, who would team up again with Lugosi while wrangling the East Side Kids in 1941’s Spooks Run Wild - see review). He has a comic relief idiot sidekick, photographer ‘One-shot’ McGuire, played by Donald Kerr who would go on to channel more buffoonery for Yarborough in Abbott and Costello’s horror features. They become embroiled within the murder mystery, going so far as to even fake their own bat (as opposed to the real fake one) to stay on the story. Meanwhile Dr Carruthers maintains his trustworthy demeanour in front of the dwindling family, who after Don and Tommy almost their beautiful daughter Mary (occasional Three Stooges support Suzanne Kaaren) to a bedroom bat visit. And so begins a stupifying game of matched half-wits between the newspapermen and their scientist suspect. The only horrifying element of The Devil Bat is the laughable obtuseness of the Heaths and more alarmingly their journalist helpers in not connecting the overwhelming evidence indicting Carruthers. The after-shave has been established as the deadly homing beacon drawing the bat to its victims. Carruthers brazenly admits to Layton that he created it. He also has the only obvious motive for killing members of the same family, a grudge that everyone in town knows about. Moreover, who else could have the cologne of death since his laboratory is in a secret location preventing anyone else from stealing it? Finally, Carruthers the bat-man is all in a flap when Layton applies the lotion to himself and dares the doctor to stand vigil with him to await a winged mouse attack, splashing him for good measure. There are no prizes for guessing who succumbs and the verdict “It’s too late to help the doc” is sadly true in more ways than one. For a horror film centred on fatal smells, The Devil Bat makes no scents. Still, PRC thought it had enough fragrance to recycle it twice as The Mad Monster in 1942 and The Flying Serpent (1946) followed by a direct sequel, The Devil Bat’s Daughter, the same year.